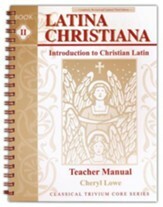 This detailed teacher's manual accompanies Latina Christiana Student Book II (out of print and no longer available at Christianbook.com). Each lesson plan includes cue words for recitation, reduced student pages with the correct answers overlaid in red ink, a lesson with examples, exercises, and instruction, a word study, and assignments. A page is also provided for the teacher's own notes. Five reproducible tests and a quiz for each lesson are provided with answer keys. A history guide & key features abridged questions with answers based on the book "Famous Men of Rome." A Roman timeline, memorization selections, songs, grammar forms, hymn translations, grammar drill and Latin-English vocabulary list are also provided. 204 pages, spiral-bound, softcover. The free, abridged Famous Men of Rome guide is now in the Teacher Manual with overlaid answers.